Nails are often looked at as a purely, aesthetic feature, and they aren’t given enough credit for their ability to provide crucial information about our general health. When our nails look good we often feel great too. Ideally, we’d all love our nails to be perfectly manicured 24/7, however sometimes that just isn’t the case. Keep reading to find out about some of the most common nail conditions, and how you can stop them from progressing through small changes to your daily routine. Cuticle Creams Are Your Saving Grace – Cuticle creams help to nourish dry cuticles by adding a much-needed dose of vitamin E into the mix. Including a cuticle cream as part of your nightly beauty routine will provide some extra protection, and reduce risk of nail infection. Wear Gloves During Housework – Housework is an absolute necessity for a lot of us, and try as we might, there just isn’t any avoiding it. It is important to remember to wear gloves when carrying out any housework, as many cleaning products include harsh detergents, which can cause splitting in the nails. Applying a good, thick moisturizer to your hands in the night, will keep dry nails at bay, and not to mention, have your hands looking, and feeling great. Multivitamins for the Win – Including Vitamin A, C, and calcium supplements as a part of our everyday diet, can do wonders for our nails. These have a positive effect on our overall wellbeing, but are especially great in promoting strong, and healthy nail growth. Yellow nails are usually a result of fungal infections. 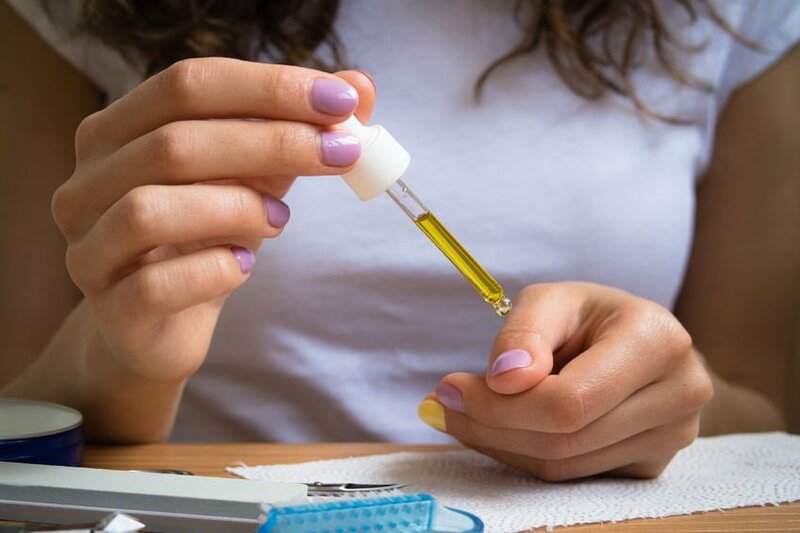 However, other causes such as frequent application of nail polish, or medical conditions like jaundice, could be the reason behind the discolouration. It is important to visit a trusted professional in order to get a sound diagnosis. Going to your local doctor will mean you can identify what the problem is, and get the right treatment; restoring your nails natural colour in the process. If your nails are often breaking at the sides, there is a good chance this is a result of malnutrition. Diets that are high in junk food could mean your body is lacking crucial elements, such as Iron, and this is likely to lead to weaker nails. There is a lot of information available on different vegetables, and the positive effects they have on the nails; vegetables such as broccoli and leeks are not only iron rich, but will improve your body’s ability to effectively absorb protein. Remember, eating smart is the best way to target areas of the body that are lacking minerals and nutrients. Dark discoloration in the nail, can occur for a number of reasons; some more serious than others. A good dermatologist will be able to review your entire medical history, and assess the shape of the discoloration, all the time answering questions regarding any concerns you might have. Peeling nails is one of the most common nail conditions, where the typically tougher layers of the nails peel, and flake off. As well as being rather unsightly, this is a condition that is also considerably painful. It is usually an indication of poor lifestyle habits or a response to the nail being subjected to some sort of trauma. Fear not, you can beat peeling nails with a bit of increased nail care. Shaping and filing your nails, if not already, should be a part of your daily routine in order to maintain healthy nails. Nail files are inexpensive, and can be picked up at your local drugstore. It is best to invest in a good nail file; take note, four-sided nail files include different textures, all designed to effectively improve your nail strength. When trimming your nails, it is important to remember not to go too short, and where possible, trim nails before shaping. So now we understand just how important good nail care is, in order to spot, and prevent common nail conditions effectively. Understandably, it isn’t always easy to give your nails the proper TLC they deserve, but that doesn’t mean you should go without. Why not put your nails in the hands of a trusted professional? Book Your Lifestyle provides 24/7 access to a window of friendly nail experts; available for you to book with just the click of a button.